The party is over. The confetti clings to the floor, reluctant to be swept away. The hats and horns are conspicuous with glittered hot pinks, blues and golds. And so the new year begins. Maybe you had a New Year’s Eve like this or maybe you sat quietly at home in front of a fireplace. Maybe you kissed at midnight or maybe you slept through it. Either way, the new year is a natural time for reflection and goal setting. As a leader, one of the most effective activities you can do is to set a goal for the new year– not ten goals–one goal. 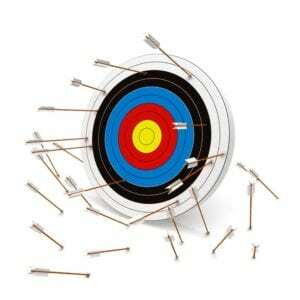 The value of setting a clear goal is that it keeps you focused amid the bombardment of distractions. Your challenge is to set the goal that will make the most difference and then focus on it relentlessly. That sounds good, doesn’t it? And, frankly, it’s excellent advice. It’s just that, honestly, I’m terrible that this. I have many goals, not one goal. Maybe you’re in the same boat. Really…what is that one big goal? It’s not constructive for me or for you to fragment our focus. In this article, I’ll examine my own struggles and see if we can come up with a workable approach together. Okay? Here we go. Step 1. Make a list of the goals you’d like to accomplish this year. Go ahead….make the list. What do you want to have completed this time next year? Now, step back and see what you have. My list has seven main goals, each with bullets. Step 2. Triage. Identify the goals that have the biggest impact. What does it mean to have impact? Is it an activity that makes money, grows visibility, advances a cause, positions the organization for future growth? Those are high priority. Now, which goals can only be executed when others are finished? Those are medium priority. Even after triage, there may be too many high priority goals. There are for me. But, here’s the problem. You can’t effectively execute them all with high quality. Or can you? Step 3. Gather more resources. Which goals can be tackled by others? Can you hire or delegate one or more goals? In my case, the answer is – probably. Identify the goals that can be associated with someone else. Note the person and the role they will play. Set a time to talk with them about the new assignment. Step 4. Brutal prioritization. It’s time to be brutal with yourself. First, find any goals that are easy and quick. Next, think long and hard about which goal REALLY matters. Which goal, when accomplished will make a tangible difference now or for the future? Which goal, if not accomplished, would make you feel like you missed an opportunity? Hopefully, you whittled the list to one or two. In my case, there are two. One is an action and the other an attitude while taking the action. I have my focus. Have you identified that one goal that really matters? Step 5. Be accountable. You’re not finished yet and neither am I. Set up an accountability method that maintains your focus. Tell a mentor or trusted colleague about your goal and ask that they check in monthly. The point is to stay focused on your priority. You’ll be lucky to make it through January without some distraction derailing your priorities. You need an accountability system to keep your eye on the goal. Here’s my accountability system. You. You see, my top priority goal is to refocus my business on Insightful Leadership. I’m redoing the website and aligning all products and services to support the development and growth of insightful leaders like you. The newsletter articles, programs, webinar series (to be launched this year – a secondary goal) and future books will center on development of insightful leaders. Hold me to it! Posted in Decision-Making, Leadership by Shelley Row on Posted on January 2, 2018 by Shelley Row.